At First Class Plumbing, we are experts in sewer line repair. We work with residential and commercial customers throughout the Baltimore-Washington DC area, including Northern Virginia. 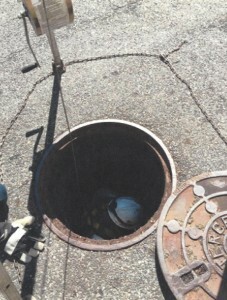 Sewer line repairs are necessary in a number of situations. Aging sewer lines corrode, collapse or crack, tree roots get into the lines, a homeowner or a construction company inadvertently cuts into the sewer line. Whatever the reason, you can count on First Class Plumbing for timely and expert repairs. We offer emergency plumbing service 24/7, 365 days a year. Our trucks are fully stocked with all of the necessary tools, parts and piping needed to complete any sewer line repairs. If a pump truck is needed, we’ll send one out. We’ll use our TV Camera to examine the sewer lines before beginning repairs, so we understand the full scope of the situation. If it’s a catastrophic failure of a sewer line, it will be obvious. But sometimes if it’s a smaller problem, you may need to look for the signs of a sewer line problem. • Gurgling noises from the toilet. • No water in the toilet. • A bathtub that won’t drain/drains slowly. • Sewage backing up in your toilet and/or tub. • Foul odor in the basement or yard. Sewage might not be making it out to the municipal sewer line. This is a major health hazard.